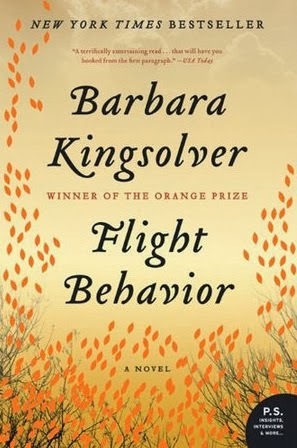 As a Barbara Kingsolver fan, I don't know why it took me so long to get to reading her latest book, Flight Behavior. I found it completely enjoyable. I even liked the slightly over-the-top rants about environmental destruction. I liked the way some of her characters -- especially the central character, Dellarobia -- view the selfishly motivated interests that encourage doubters and science-haters. I appreciated the sympathetic creation of characters with several different points of view and different social status, and how she depicts their interactions. I would encourage my book club to select this book, but I think it exceeds our maximum length requirement. The book's setting is in rural Tennessee, near a small town where almost all the businesses have folded, and where many people's skills at making or selling things have been rendered obsolete by cheap imports from China and other aspects of globalization. Dellarobia's late father had been a skilled woodworker, making beautiful toys, furniture, and Christmas ornaments. Her late mother had been a tailor and seamstress, whose beautifully crafted women's suits still showed their quality when they appeared in second-hand junk stores years after she had made them. No one any longer valued skills like theirs. Does this all sound too pat? Kingsolver makes you totally understand how this all affected Dellarobia and the people around her. I guess creating a sympathetic and intelligent woman character who grows up with little opportunity to use her intellect is a really big Kingsolver talent. Dellarobia is a young mother whose college hopes had been destroyed by the death of her parents and by her teenage pregnancy and consequent marriage. Her efforts to be a competent wife, mother, daughter-in-law, raiser of sheep, and aide to a scientist (as well as several other efforts) are depicted in a fascinating way. She learns, and we get to see her learn, through her relationship with her very bright kindegarten-age son, her not-so-bright husband, and her cold and unforgiving in-laws, and by her employment as an aide in a science laboratory. Her religious faith is depicted in a fascinating way as well. photo to help my visualization. Soon TV news crews, a group of scientific experts, a variety of tourists, and members of political groups appear at Dellarobia's property to see the butterflies, study the butterflies, or create some type of story about them. Out of this set of circumstances, Kingsolver weaves what I find to be a wonderful tale. I recognize that there are many choices in this work of fiction that would lead some readers to doubt how convincing it was, but I enjoyed it all -- except, unfortunately, I found the ending somewhat unsatisfying. 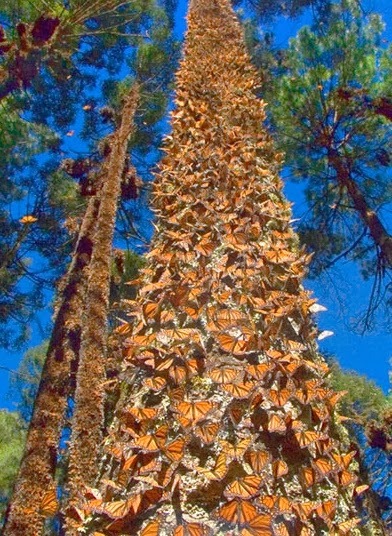 UPDATE, Jan. 29: I just read an article about the actual crash in numbers of the monarchs in Mexico, just as the book described, even including the reaction of guides who had once shown the masses of butterflies to tourists. The decline is attributed to "the displacement of the milkweed the species feeds on by genetically modified crops and urban sprawl in the United States, as well as the dramatic reduction of the butterflies’ habitat in Mexico due to illegal logging of the trees they depend on for shelter." -- Washington Post: Monarch butterflies drop, migration may disappear. This sounds wonderful, Mae. Certainly we can all relate to the small town that has folded, the workers displaced by items from China. (I just visited a place like that in December.) Sounds like it is my kind of book. Thanks!